The Venetian ambiance of Alleppey is enhanced by the coir-made houseboats that punt along leisurely on the backwaters. A wealth of temples and churches add character to this understated seaside resort. The Alleppey Beach is another highpoint â it is a pristine stretch of sand lacing the choppy Arabian Sea, with an old character-filled pier, about 140 years old, extending into the sea. There is a wide range of good hotels & resorts in Alleppy for visitors where tourist can feel the comfort of home. 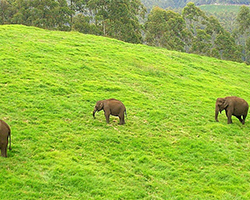 And get the beautiful Munnar sightseeing in our best Kerala tour package. After breakfast proceed to Alappuzha (or Alleppey) the beautiful coastal town in the Indian state of Kerala. Known as the gateway to the rustic Kerala Backwaters, this town is laid-back and relaxed. If you plan to stay in the town, you can spend your days by relaxing at its lagoons, watching sunsets on its beaches, bird-watching at its lakes, or wandering through its many palaces and temple complexes. Evening Return to the resort and overnight stay.